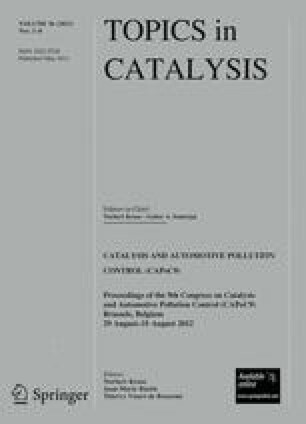 Three-way catalyst-based automotive exhaust gas aftertreatment is of high importance to meet today’s emission standards. To determine in situ the oxygen loading state of three-way catalysts, a microwave cavity perturbation method is used. In this study, it is investigated whether this measurement setup that had originally been described for full-sized catalysts can be transferred to a lab test bench using cores of 1″ diameter. The initial tests were successful and a high correlation between the oxygen loading degree dependent resonance frequency and the conversion was found. As an application example of the new in situ characterization technique, the steady state degree of oxidation of a three way catalyst was measured as a function of the exhaust stoichiometry. The experimental results are compared with the prediction of a recently published improved kinetic model that takes into account the oxidation of reduced ceria by H2O and CO2. It is shown that the experimental observations agree very well with this improved model. This result provides evidence that under typical operating conditions, the degree of oxidation of the three way catalyst is controlled by equilibrium effects. The authors R.M. and G.F. gratefully acknowledge DFG grants MO 1060/13-1 and FI 956/5-1, respectively.